I went with Kevin to some appointments the other day and while I was waiting I took off and started walking, I ended up in a local K-mart. I looked around and decided that I needed to use the restroom, before I headed back. I asked one of the employees where they were, and he said all the way in the back in the corner. I headed that way and found a Single restroom. I opened the door to see this. I laughed and thought to myself, why didn't they have these when I was a kid. The toilet was a scary thing when your young enough to fall in. You know how it was, climb up on it, sit with your feet hanging off the edge, holding yourself up with both hands and hope that you can balance yourself long enough to wipe with out falling in. Who ever came up with this idea, was brilliant. Oh geez Allen, you brought back lots of memories I have about fearing falling into the toilet when I was super young. Wow! These might be the youngest memories I have. Toilets terrified me. I thought I'd get sucked down. Okay, here' how MY mind works. The first thing I thought of was "handicapped" toilets. Then I thought, oh, yuck, two toilets side by side in ONE room? Double Yuk. 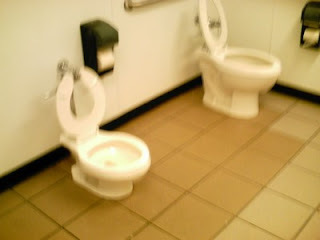 Then I thought, well, you guys are used to peeing in front of each other, so I guess the next step is pooping! So this all flashed through my mind, albeit, in a matter of seconds, then I realized it was a child's toilet. Right? Or is a a toilet for midgets, or the more pc thing to say, is "little people"? Did you start humming, "I'm off to see the "Whizz-ard" when you went in there? Oh, never mind. They have bunches of these short toilets in daycare centers and preschool ministries. Even when you see them often, they are still pretty cool. I agree it's great that kids have things sized right for them. @ Larry, yeah public toilets all ways scared me. @ Miss Lynda, I agree with you. I just wish they had it when I was a kid. @ Sue, I thought so too.